Cyber threats have evolved to evade the detection capabilities of traditional security tools. The malware powering botnets/ransomware/IP theft is also breaching networks and systems in new and innovative ways. In order to find these advanced threats, content inspection must move beyond traditional executable file analysis in virtual environments. Observing malware behaviors on a deeper level and using intelligent file detonation are critical to detection. 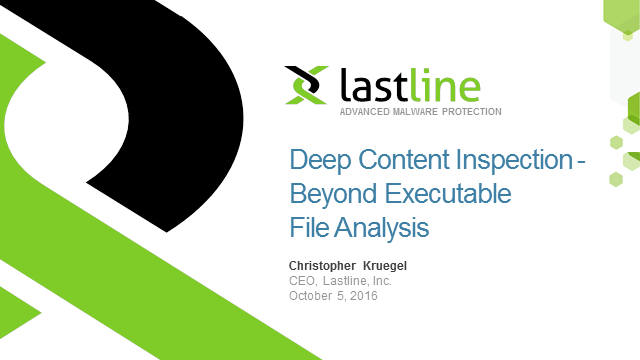 In this presentation by Christopher Kruegel, CEO at Lastline, you’ll learn how a Full System Emulation (FUSE) approach provides improved visibility and enhanced malware detection. Kernel-level object inspection and machine learning are combined to defeat the evasive techniques of malware hiding in documents, email traffic, HTTP web traffic, SMB traffic, and more. Christopher Kruegel, CEO at Lastline, Inc. Presented by: Christopher Kruegel, CEO at Lastline, Inc.